This entry was posted on February 4, 2016 by Y Hasegawa. "The craftsmanship and pattern was just beautiful!" In his recent testimonial, we love Benjamin's word choice for what he felt upon opening the packing once the futon arrived: "delighted"
I spent quite a long time looking at different websites to purchase a futon as well as browsed videos on Youtube. I happened to run across the videos by futonbedsfromjapan and really enjoyed the videos explaining the traditional Japanese futon. It was also hard to find futons actually made in Japan! I was also astounded by the short amount of time it took from ordering my futon to receiving it at my door! Once I opened up my futon I was immediately delighted. The craftsmanship and pattern was just beautiful! 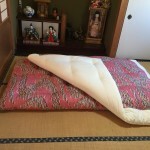 On top of my tatami mat floor, the futon was very comfortable and I had a great first experience with my futon! It is much different from the thick soft bed I used for about 10 years, but my back feels great and I slept like a brick! Overall I am extremely satisfied with my futon and the friendliness of the owner, Dean Fuller. Thank you! Jennifer Knew Exactly What She Wanted: An "Authentic Japanese Futon"
We're were very happy to hear that once she had a chance to spend time on our site, Jennifer had decided that there was "no obstacle" that would prevent her from ordering from us. There was no obstacle that would have prevented me from buying because the videos made me want to buy one. I already knew I wanted an authentic Japanese futon but was having trouble finding a site that felt 'right.' Seeing how and where they are made and seeing the owner made it a done deal. Just received the futon yesterday -- would recommend the company for anyone who is interested in such a purchase. Thank you! Back Pain Relieved by Futon? Do I need Tatami Mats? What Should Go Under My Futon? Finding Traditional Japanese Futon: You Have Exactly What I was Searching for! Tatami Bed on Do I need Tatami Mats? What Should Go Under My Futon? Authentic Japanese Futons Hand-Made By A True Master In His Small Family-Run Business In Kochi, Japan. Futon Beds from Japan Sells 100% Authentic Master-Crafted Futons Made In Japan. Experience Top-Quality Hand-Made Futons Delivered Freight Free To Your Doorstep. "Everything from inquiring, to ordering, to the shipping was such a smooth experience. To purchase from a small town in Japan and receive the item so quickly and without any problems was amazing." The purchasing experience with Futon Beds From Japan is superb. Any questions or special requests are met with a prompt and thoughtful reply. Dean quickly gained my trust concerning futon so I was happy to expand my purchase to include zabuton and kushyon. The quality of the products are as promised, and I now am enjoying a slice of the look, feel and smell of traditional Japan. Thanks Dean, for sharing the joy of this exceptional craftsmanship with me! The customer service was personable and informative. My purchase arrived 5 days after it was shipped. The quality of the fabric and craftmanship is excellent. I have already recommended these products to friends. All in all this has been a great experience. I love the futon I received. It is very beautiful with vivid color, looks better than the picture shown on the web. The fabric is very good and comfortable. I am pretty satisfied with the feeling of laying on it. Also, it comes pretty fast. It was packed carefully and in very good condition. Love it! The queen set that I recently purchased is amazing! The product looks great online and even better once it was received. It arrived very quickly and the packaging was in perfect condition. The futon and quilt are extremely comfortable and the quality is fantastic. I ordered this product for back and health reasons and I'm glad that I did so. I will highly recommend this product and the website to everyone! Everything about the experience (from navigating the website, ordering, shipping and product quality) was great. I will definitely purchase more products from here in the future! Thank you ! Dean was very quick to return my call, and was extremely helpful and pleasant! "I really like that I can fold up the futon and store it in the same room where I use it...and no hassle with blowing up air beds, metal frames, etc. I can seamlessly change my yoga room into a guest bedroom room when needed." "We are currently in a small room, and a futon that folds up nicely is great for space. Love it! It is like being in Japan. So happy that there is this service to get a real futon from Japan -- thank you! I would recommend this way of sleeping to everyone! " I thought the videos were informative and helpful in making a decision to purchase from you. I was also pleased with the quick response from Dean and the friendliness of his e-mails. I wanted to make sure I got an authentic Japanese futon, since this is what my daughter had used on her study-abroad in Japan and she has said that she is not sleeping well since returning to the U.S. I hope this will help her with her sleep. Dean was very professional in responding to the questions I had since I was ordering custom sizes. The fabric was beautiful, very soft and very comfortable. The craftsmanship was perfect. I was so surprised to see them on my doorstep within days of ordering them. I ordered my first one a few of months ago.. then later a second one.. I couldn't help myself and decided to dress the two other beds this past week. LOVE them! Thank you. "I was more than pleased receiving my shikibuton and kakebuton set with custom cs. They were beautifully hand made, and so amazingly comfortable. The pattern, quality, and comfort totally make this traditional Japanese futon set my favorite bed I've ever slept in. Thank you so much for the beautiful work." "I had concerns in switching to a vastly differently sleeping platform, but have enjoyed the futon and plan on having one always available in the future." "I love the futon set! I use it on a tatami platform bed and it is SO very soft and warm. Should have made this purchase long ago. And the staff was great - they noticed (from my initial order) that I might have forgotten an item, and they were right! They had very quick responses to my questions - it really was a great customer service experience all." "There was no obstacle that would have prevented me from buying because the videos made me want to buy one. I already knew I wanted an authentic Japanese futon but was having trouble finding a site that felt 'right.' Seeing how and where they are made and seeing the owner made it a done deal. Just received the futon yesterday -- would recommend the company for anyone who is interested in such a purchase. Thank you! " "I received my futon set yesterday, just a week after I ordered and I am delighted. It is so comfortable and cozy! I feel incredibly rested after just one night spent on it. It was a relatively big purchase but one that I think will be worth it. It is also very nice that it folds so well, since I live in a tiny studio. Dean was very friendly and amazingly helpful with the purchase." I was blown away by the personal assistance provided by Dean. In this day and age of diminishing customer service, I almost thought it was a joke when Dean emailed asking about our order. In short, the product is a true work of art, and the customer service is absolutely the best! "Very happy with my purchase. Beautiful, comfortable futon. Love the fabric pattern! Quickly delivered. Great customer service! Would definitely purchase from Dean in the future!" "I was very happy to find these all natural mattresses. I ordered a custom size to fit my travel trailer, and it was delivered to my house in California in eleven days! It's comfortable and beautiful. I highly recommend this service." "Dealing with Dean was awesome -- he responded immediately to my emails despite the 14 hour time zone difference. The shikibuton and kakebuton themselves are of an exceptional quality made by expert craftspeople. They are amazing and beautiful. In addition, I ordered a custom size which was no problem at all. Overall, a truly outstanding experience." "Yes I love the Futon and would/will order it again. Thanks so much for your prompt and courteous communications "
"The product arrived sooner then I though it would. Just what I was wanting. The videos were excellent and very informative. U did a great job putting them together. That's what made my decision easy was being able to see how they r made. I didn't want something that was massed produced. But one that was made by a family owned business. It is so comfortable and warm. I would recommend u to family and friends." "The futon is great! It's very light weight and soft - perfect for my small studio apartment. Also Dean was very responsive and helpful when I had questions in the buying process." "Futon Beds From Japan represents the best source for authentic Japanese futons of the finest quality. They offer lots of beautiful fabric patterns and the materials are all natural. Would recommend them to anyone looking for a comfortable and affordable option for sleeping -- futons or otherwise!" "As I wrote previously in my last testimonial, customer service was impeccable, delivery was ridiculously fast (I think I got mine in 6 days and I live on the east coast) and the futon was exactly what I'd wanted. futonbedsfromjapan has me as a customer for life." "Ashley loved her futon quilt top that matches the futon she got for Christmas. Once she saw the package, she knew what it was. She snuggled up with it right away. Now, she wants her dad to help her build a bed frame for the futon, since it can be a little cold on the floor at college. The fabric is wonderfully soft and beautiful to look at. We were very happy with the quick delivery, too! Thanks so much!" "My futon is gorgeous! When my brother saw it he decided that he will be purchasing his own futon from here and is in the process of looking at fabric patterns right now. I am thrilled not only with the high quality product, but also the outstanding customer service." "My futon is fantastic. I am planning on purchasing a single for when guests show up. Love the resealable vacuum bags." "I requested changes to the futon fill amount and Futon Beds from Japan were very cooperative and accommodating. The futon set arrived promptly (considering it was coming from Japan it was arrived actually faster than I expected) and was excellent quality and as I ordered. Very glad I found the site." "This was my daughter's choice of gift for her 16th birthday. It arrived yesterday and as soon as she unpacked it she went to bed. She woke at 4 am saying "it drained the tiredness out of me." Definitely success." "The futon is beautiful and very well made. Dean was a pleasure to work with as we had some website challenges. Im a side and stomach sleeper and there is enough cushion to keep my joints comfortable and firm enough to give me a very nice night of sleep!" "I was looking for a more firm mattress for my back and was currently sleeping in my floor with a camping pad. I decided to upgrade did my reader and found that Futon Beds from Japan was exactly what I was looking for. I will be using this company in the future to purchase accessories and other futons. Dean was always very prompt to respond to my emails and answer any questions. Also, my futon was delivered without any difficulty. Great product and fabulous customer service. Thank you Dean! " "I had previously purchased a single futon. I got a second one so that I could provide bedding for two guests, or double them up to provide extra soft bedding for one guest. I like that the futons fit on the floor of my closet. They don't get in the way, but are very accessible when guests stay ." "I love the futon. Will make a custom frame. Will look outstanding. It is very comfortable and well crafted. Fair price and would recommend." "Although hesitant about purchasing a product that I had never tried out, your futon exceeded expectations. My first night was much more restful than on my old bed. I have a very hard time getting a good night sleep. All I can say is that my first night sleeping on your futon was delightful!" "We are very pleased with the Futon, and will definatly recommence the products to others because its a good product, and service is excellent." "Excellent, personable service and a wonderful product. It has not taken me long to adjust to my new futon and already I'm waking more refreshed and less sore than I have in years "
I'm happy that these beautiful and authentic Japanese futons are available, and that they are made of natural materials without toxic additives. The promise of an authentic and beautiful Japanese futon is met and the quality is excellent. "The futon I have received is extremely comfy and is a pleasure to sleep on, thank you very much! " Note: FutonBedsFromJapan.com is a 100% Japanese owned and operated company. Get the latest information about new futon patterns and other authentic Japanese products we will be introducing in the future.